Power Rangers will be Lionsgate's first Dolby Vision 4K Blu-ray | What Hi-Fi? The disc will be available in June, around the same time as Universal's Despicable Me and Despicable Me 2 touch down, also with Dolby's imaging tech. Lionsgate has announced its first 4K Blu-ray with Dolby Vision tech will be the forthcoming Power Rangers movie (via flatpanelshd). The film will arrive in June, which is the same month that Universal will release its first two films using Dolby Vision. These are Despicable Me and Despicable Me 2. Dolby Vision is a version of HDR (high dynamic range) that results in a greater difference between the light and dark sections of an image. The result is a more lifelike picture with more depth. 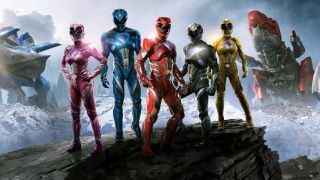 Power Rangers will use Dolby Atmos technology for its soundtrack, unlike Despicable Me and Despicable Me 2, which will use rival technology DTS:X.
Lionsgate is one of only three studios to support Dolby Vision, the other two being Universal and Warner. 20th Century Fox and Paramount are yet to commit to Dolby Vision, while Disney/Pixar is yet to release any titles on 4K Blu-ray. Power Rangers is based on the TV series of the same name. It follows five ordinary high school students who must transform into superheroes in order to fight an alien threat. It will be released on 4K Blu-ray on 27th June in the US. There's no word on a UK release yet.